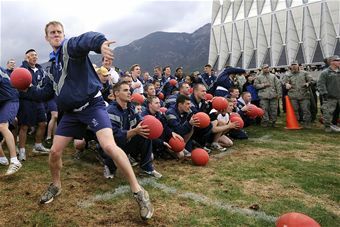 Air Force Academy cadets managed to bounce their way to a Guinness World Record on May 18 by holding the world’s largest dodgeball game ever played, featuring 3,612 participants. But blink and you might have missed their place in history. By the time the cadets received confirmation that they had successfully broken the record set at the Rochester Institute of Technology (the 2,136-player game at RIT is still listed as the record-holder here), another school had already set a new mark. In September, 4,488 students at the University of California-Irvine participated in a dodgeball game, breaking the cadets’ record.